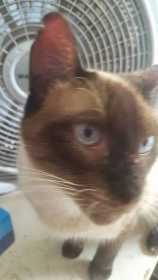 Jax is a chocolate point Siamese with Blue eyes. He is neutered. Missing from the 300 block of 10th Ave N in Texas City, Texas.